This page summarizes the most frequently asked questions concerning the projects found on the http://www.uCApps.de website. It will be enhanced with every new interesting questions and will be modified with every new awareness. Feel free to ask in questions in the MIDIbox forum http://forum.midibox.org or edit this document by yourself if you are missing an important question, don't understand an answer or if you found a better solution in order to improve this “living document”. µCApps stands for “Microcontroller Applications”, and is the name of Thorsten Klose (TK)'s MIDI DIY home page. Which skills do I need to build a MIDIbox? There are a lot of people who built a MIDIbox without having any knowledge about electronics before starting. However, if you have never learned to solder, you could start on the soldering page. Can I control my sequencer with the MIDIbox? Yes, of course! :) Most modern sequencers like Cakewalk, Sonar, Cubase, Logic offer a MIDI Remote Function. You can control the faders and trigger functions like mute/play/reward/record/… with the buttons. Refer to the manual which comes with your sequencer. There are also special MIOS applications available like MIDIbox LC (Logic/Mackie Control Emulation) or MIDIbox MM (Motormix Emulation) which are communicating bidirectional with the host application over a specified protocol, they are the most flexible solution for displaying track/instrument/parameter names, since these messages are sent by the host itself. But they also need to be supported by the host software, so check this before. I posted a message in the Forum/I wrote TK an e-mail three hours ago, why I haven't received a reply yet? Since TK receives such complex concepts for dedicated solutions nearly every week and noted that reading, understanding and answering consumes a lot of spare time, he decided not to read “concept requests” which are longer than 20 lines of text anymore. Inspiration is always welcome, but he's not coding for your private wishes. Will you make a synth based on (insert name of chip) for me? How hard would it be to make a synth based on (insert name of chip)? Generally, if you can't answer this one yourself - too hard for you. Remember - if you want to start a project based on the MIDIbox, you have to do it all on your own! There are some ready, digitally controlled tone generators out there, which you can buy with complete documentation - many of them are easy to work with, the companies give you all the documents you need, many chips have application notes and guides, the companies also have active communities and even support specialists which you can waste the time of ;) Try tinkering with those first, if you want to. When you're taking a chip out of some vintage computer, you're always dealing with zero support, zero documents, zero manuals, zero guides, zero application notes, and you don't even know if you fried your chip while unsoldering it :) So, if you've never hacked into a microchip - don't expect success at the first try. I can't log into the forum! I can't log into the Wiki! Where can I buy the components? Which errors can I avoid? Before you order the components, check the prices of different distributors. Mail order companies with a large variety are the most expensive, smaller companies are cheap and fast. Check also the electronic shops near by you, especially for the chassis (visual control). With luck, you will find special offers, i.e. some good pots or buttons. When buying cheap components like resistors, capacitors, diodes, pots, buttons… take at least one more to have it on stock when anything goes bust. Don't forget fitting sockets for every IC because you have to check the voltage pins with a multimeter before mounting the ICs. Furthermore a socket for the PIC is very helpful to be sure it won't get damaged while soldering. Do I need to buy a LCD for running the MIDIbox? If this is your first MIDIbox take the answer to be yes. It really depends on the application you are planning to use; most do not need an LCD for normal operation. But keep in mind that a LCD simplifies the debugging, and you are not able to use the menus which are mostly provided by the MIDIboxes, therefore customization has to be done directly in the source code or via SysEx dumps (if supported). It is very useful to have an LCD that can be plugged into the Core when needed. What's the difference between potentiometers, sliders, motor faders and encoders? A slider is another type of pot, only it is a straight line. Instead of turning left-to-right, you slider from bottom to top. A motor fader is a slider which has a motor attached to it, so not only can you move the fader to adjust the voltage sent to the Core, but the core can set the position of the slider. Encoders, aka Rotary Encoders, are often misunderstood. Encoders are not analog, like the pots are. They don't have a minimum and a maximum setting, and they don't put out an analog signal which has a varying voltage to indicate their position. One way to explain them is using the analogy of two buttons. With an encoder, when you turn it to the right, it's like pushing the “up” button, and when you turn it to the left, it's like pushing a “down” button. Buttons are just switches, like a light switch, they allow power to flow through the circuit when they are on. This is a Digital signal, because it is measured as ON or OFF, not as a range of voltages. This pair of digital signals, the “up” and “down”, can be read by a DIN (Digital In) Module, which sends messages in MIOS that your application can use to change a parameter up and down. Note that an encoder needs two pins on the DIN Module, one for “up” and one for “down”. As you continue to turn turn the wheel to the left, it's like you are pressing the “down” button over and over again. As you continue to turn turn the wheel to the right, it's like you are pressing the “up” button over and over again. This signal could be used in a similar manner to a pot. First, the position of this 'virtual pot' is stored as a value in the PIC's memory. Wikipedia has a decent article about rotary encoders. We use the 'relative' type. Should I buy linear or logarithmic pots/faders? Linear pots or faders are required for MIDIbox. Logarithmic are nice for analog mixers, but not for digital processing. In catalogs you will mostly find a “lin.” or “log.” index for every pot type - if not you should call your distributor and ask him before you buy the wrong pots. The pots itself are mostly marked with a letter. Where can I find datasheets for the parts you used? If you still do not find what you want, ry Google, type the part number and keyword “datasheet”. If you purchase parts from SmashTV's MIDIbox store the parts list includes Mouser part numbers. You search the mouser distributor site to find datasheets for all of those parts. Do I have to make a Printed Circuit Board (PCB)? If you don't want do DIY and don't want to do without a PCB, you should look for a company which is specialized for prototype boards. I.e. http://www.expresspcb.com in Europe or http://www.4pcb.com/ in the US. In Germany I found a guy who practise a private PCB service with very good prices for hobbyists: http://www.mikes-elektronikseite.de/midiseite.htm. All the private boards have been made by him within three days for about 5 to 8 EUR for each PCB. Compared to big companies like http://www.pcbpool.de, where you have to pay at least 40-50 EUR for a board, this is a really good offer. Michael Klein delivers worldwide. Since the year 2003, Tim (known as SmashTV in the MIDIbox forum) offers a private PCBs service for MBHP boards from the USA. His online shop can be found under http://mbhp.avishowtech.com. He sells also pre-burned PIC18F452 with the MIOS Bootstrap Loader which saves you from having to build a PIC burner like the JDM. Since 2010 novski develops special PCBs for more experienced DIY makers and offers a opensource download on Github as well as PCBs and Kits over his webshop www.vlrlab.com / https://github.com/novski/Midibox. How Do I get the firmware into the PIC microcontroller? You only need to burn the MIOS bootstrap loader into the PIC with a PIC programmer, thereafter MIOS itself and MIOS applications can be uploaded via MIDI. The details are explained at the MIOS Bootstrap Loader page. If you get the PIC from one of the suppliers of MidiBox boards, the MIOS bootstrap loader may already be burned into the PIC for you and you only need to load MIOS. MIOS Bootstrap Loader for Newbies is a detailed explanation of the process for first time MidiBoxers. How do I test my circuit? Continue with the MIDI Out port tests like descriped at the MIDI Troubleshooting troubleshooting page. How do I up/download a SysEx Dump to the MIDIbox? Can I use a switching power supply (known from PCs) for my MIDIbox? No, because switching power supplies require a minimal load before they start to operate correctly, and if the circuit is not drawing enough power, or only sometimes like the MIDIbox circuits, the power supply will just switch off and/or reset the circuit reiteratively. Possible Workaround: use of a permanent consumer load like the backlight of a LCD or a lamp. Permanent use of this solution has not been tried yet. Better and cheaper: just buy a good transformer (for about 1-2 EUR) or wall adapter (for about 3-5 EUR), and use a rectifier, a big capacitor, a little capacitor and a 7805 (for Motorfader Driver: 7812) to regulate the voltage. All these components (apart from the transformer or wall adapter) are already part of the MBHP_CORE module. What is the meaning of a device ID? In common MIOS applications there are two different IDs: the MIOS ID which addresses the core for code down- and uploads, for debug commands, for remote messages - and the application specific ID which addresses the SysEx handler within the main program. It depends on the application how to setup and verify the application specific ID. If it isn't print on LCD (for example within any menu), you could send some pings with different device IDs to the box - once the application returns a ping, you are sure that you've selected the correct ID. It's mostly zero by default, and you should set it to the same value like the MIOS device ID. I've burned the bootstrap loader into the PIC, but my LCD doesn't show any message? How can I connect a MIDIbox to my MIDI device/computer? For a direct connection to a common MIDI device you need to use the MIDI In and Out of the CORE module. The optocoupler behind the MIDI In port decouples the circuit from the other device to avoid grounding loops. The MIDI device “at the other side” has normaly also an optocoupler at the MIDI In. a dedicated (commercial) ISA/PCI/USB based interface with 2 or more IO ports is propably most preferable. Hint: if you are buying a new one, pay attention for “multiclient capability”. This is a very important feature, which allows you to use the MIDI IO ports with different applications (e.g. Cubase, MIOS Studio and JSynthLib Editor) at the same time! you can build the MIDIbox-to-COM interface. Both alternative solutions are not recommended for MIDIbox SID or FM due to the missing optocoupler. What is the meaning of this funny hexadecimal numbers? That are the MIDI messages which will be send over the MIDI interface. The MIDI Specification describes the most important (standardized) messages, a hexadecimal to decimal conversion table can be found here: http://www.ascii.cl/conversion.htm. Which MIDI events can I send with the MIDIbox? In fact MIOS can send any MIDI data, it only depends on the application which events can be configured without additional programming effort. E.g., with MIDIbox64/MIDIbox64E/MIDIO128 you are able to send Note/Controller/Aftertouch/Pitch Bender/Program Change Events by default. The events can be configured via the MIDI Learn function or via MIDI dumps. SysEx Streams, NRPN events, multiple events or whatever can be implemented via Meta Events. How high is the latency of MIOS? First of all it should be noted, that the latency of a common MIOS application is negligible compared to the latency of a computer. MIOS is a real-time system which runs on a dedicated microcontroller. The reaction time of the low-level drivers is deterministic, calculable and ensured. The design focus was on MIDI controllers, therefore the processor load caused by tasks running in background has to be measured against the initial latency caused by the MIDI transfer protocol. It can be assumed that the latency of MIDI itself is about 1 mS: the baudrate is 31250 bps and a common Note or CC event consists of 3 bytes (the running status which makes the transfer faster is not taken into account here), this results into a transfer delay of 960 uS. Additional delays are caused by the UART, the optocoupler, the buffer logic (MIDI Thru port…), but I don't want to get lost in details here… it's more important to know, that this latency increases with more complex events like SysEx or NRPN (at least ca. 2-3 mS) and the number of events which should normally happen at the same time, but must be pipelined through the serial interface. With these values in mind, the so called system tick of MIOS was designed to be 1 mS. This is the minimum sampling/update frequency of the DIN and DOUT chains. The approximative task is running in background and interrupts the main program every millisecond with high priority - only the priority for receiving incoming and transferring outgoing MIDI bytes is higher. The MIDI transfer itself don't use so many system time, since it's buffered with 64 (incoming) and 48 (outgoing) bytes. This means that when a short MIDI stream i sent, the program will continue to run without waiting until the transfer finishes. Of course, big SysEx dumps will stall the main program, but they won't stall the background tasks! Incoming events: from my observations mostly only 2-3 bytes of the 64 byte MIDI-In Buffer are allocated. This also gives an impression of the overall system performance: 3 bytes == ca. 1 mS maximum waiting time until an incoming event has been processed. But nothing is without exception: if incoming data is received while the main program saves data into EEPROM or flash memory, the buffer could be filled rapidly due to the long writing times (5-10 mS for a page). Worst case scenario: the CPU will be suspended when writing data into the flash memory, during this time all events (DIN triggers, AIN changes, MIDI data) will be delayed or lost (among other things, this is the reason why you must specify a transfer delay in MIDI-OX). Speaking about analog inputs: they are scanned periodically; each input takes 200 uS, so 64 inputs take 12.8 mS. Higher scan rates make no sense, since the signals have to be “settled” before the conversion – to avoid jittering values which are acceptable for audio applications, but not for a MIDI controller. But wait: 12.8 mS is not the real latency of the AIN driver because of the Dynamic Priority handler ™ which scans the last two changed AIN pins more often than the others. This means: if you tweak two pots at the same time (with your two hands — or do you have more? ), the resulting latency of those two will be much less than the others (about 1-2 mS). High performance inputs/outputs: yes, they do exist The DIN and DOUT chains are intended for common digital IO, but sometimes it is required to interact with an external peripheral much faster than 1 mS. Examples: IIC devices like the BankStick, an LCD module or the MBHP_SID module. These devices are connected to dedicated PIC pins which are normally controlled from the main program. It's very hard to measure the latency to these modules, since they are normally serviced with lowest priority. More deterministic IO can be realized by using the timer ISR (USER_Timer). This leads us to the USER_Tick, an endless iteration loop which will be processed when nothing else is to do. One iteration can take from 10 uS to 1 mS and more, it just depends on the system load. In normal applications it rarely exceeds 500 uS. Last words to the MIOS programmers: take care that periodically called interrupt service routines (ISR) are running as fast as possible so that other ISR tasks are not blocked. Especially take care that they never exceed the 640 uS threshold, since this is the time for which the PIC UART can buffer two incoming MIDI bytes before the double-buffer overruns (worst case, back-to-back transfer). Time consuming calculation routines should be split into several pieces and executed in rotation with every USER_Tick iteration so that every low-priority task gets the chance to do its stuff as often as possible (a simple implementation of preemptive multitasking). And a last tip: don't print text on the LCD immediately after an AIN or DIN event has been notified, but just request an update (as demonstrated in all example MIOS applications). This saves the system from unnecessary lags caused by rapid display changes which will be overwritten immediately and therefore not visible for the user. What the hell are Double-Note-Events? Programs like Cakewalk, Cubase, Logic, … support MIDI remote, which allows the user to control the software with his MIDI keyboard or something similar. Normaly MIDI remote works in a manner, that one note has to be played to enable MIDI remote (→“Shift” key), and another note at the same time to trigger a function like Play, Record, Pause, Forward, Rewind and much more. The MIDIbox64/MIDIbox64E simplifies the use of MIDI remote with Double-Note Events. You only have to press _one_ button in order to play _both_ notes which are necessary to trigger a function of your software. Double Note Events can be assigned to the buttons with the meta codes _F0 08_ to _F0 0F_ (see also mb64_meta.inc, resp. mb64e_meta.inc). How many pots/ faders/ buttons/ encoders/ screens/ LED's/ etc is the maximum that I can connect? There are two parts to this answer. The first relates to the standard hardware, the second is related to the implementation of that hardware. Now, connecting the hardware physically, and actually being able to use it, are two different things. One or more, but not necessarily all, of the previous options are available in standard MIOS Applications. For more specific information, see the page related to your application on uCApps All options will be explained there. If you are using a standard application, most of the time only the main.c/main.asm and/or configuration files for the application will need to be altered, to tell the application which hardware configuration you have built. Can I use PWM to control individual LED brightness ? The short answer is that using PWM on DOUT to do individual brightness control on a large number of LEDs is not possible as it would overload the Core. The longer answer, as mentioned above, is that this is possible using specialised LED driver chips but you would need to interface these to the Core yourself. Can I connect other parts aside from pots to the analog inputs? Yes, you can connect anything which delivers a voltage between 0 and +5V like additional buttons, CV outputs of antique synthesizer equipment, or just external effect units like LFOs, see the MIDIBox Extensions page. How do I add a MIDI Thru Port? Find the circuit under http://www.ucapps.de/midibox/midi_thru.gif - the 74HC00 is used to amplify the received MIDI signal. The MIDI Thru Port will not work without this amplifier. Can I power a PIC from the MIDI line without additional power supply? Thats very problematic and mostly doesn't work properly - the MIDI specification doesn't take this into account. The MIDI line is specified as current loop, and the maximum voltage level is not defined. Most interfaces deliver a logic signal with TTL level between 0V and 5V, a 7805 regulator between MIDI Out and the PIC power pins would reduce the voltage to <4V, so it should not be used in this case. Instead the ground pin and one of the outer pins which always supplies 5V (has to be checked with a measuring instrument) should be connected directly to J2 (behind the 7805). A diode has to be added in serial to prevent back-currents. An additional cap (100 uF) stabilizes the voltage level if a large amount of MIDI data (low/high pulses) is received. Note: some people who tried this with the MIDI merger and the MIDI processor reported that this is working, others not. Somebody tried it with a very small PIC (16F628) at low frequency but without success on his Yamaha CS1x MIDI keyboard. I don't provide a schematic here since I cannot guarantee that your MIDI interface won't be damaged during the experiments. So, the information above is only relevant for experienced electronic experts. Why are you using the PIC and not a more modern Microcontroller? TK: “I started my first MIDI projects in the 80's with a C64, later I worked with 8051 derivatives. 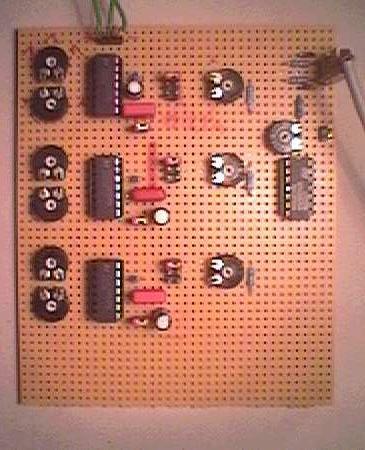 Sometime along the way I decided to use a PIC controller because it *was* modern during many years - cheap, easy to program, almost non-destroyable, no SMD package, high availability for hobbyists. Although I have worked with a lot of 16 and 32 bit controllers in the meantime (job-related…), I stick to the lovely PICs in order to reduce my support effort for these sparetime projects. Do I need a deep knowledge of PIC microcontrollers in order to build your applications? Where can I learn more about PIC microcontrollers? Get all the interesting datasheets and application notes from the http://www.microchip.com website and check the famous http://www.piclist.com site. How do you develop your applications? Update: Please see the Application Development page for new info! Mostly I develop under Linux. I'm using XEmacs http://www.xemacs.org to edit the source, GPUtils to assemble the code and the MIOS bootstrap loader http://www.ucapps.de/mios_bootstrap.html to upload the application into the PIC. Would you build a MIDIbox for me if I give you some money? As everything is free, am I allowed to bring the stuff to market? Only under special circumstances. See also this forum article.